A new, online tool aims to make career information more accessible for students and job seekers in the Louisville, KY region. 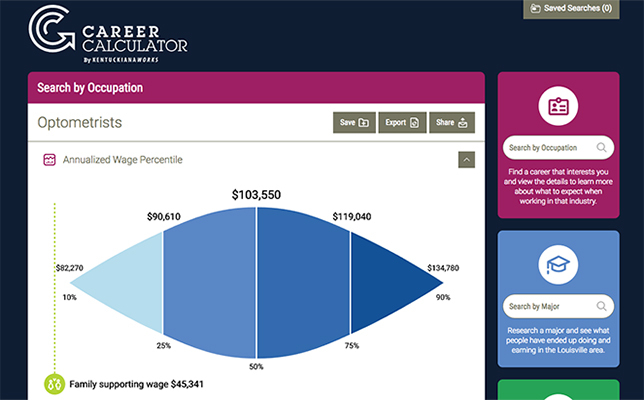 Career Calculator allows users to lookup labor data by occupation, education level or desired salary. The web-based application leverages datasets, including Economic Modeling Specialists International, United States Census Bureau of Labor Statistics, O*NET Web Services and the Kentucky Center for Education and Workforce Statistics. It is designed to help users make data-driven decisions and discover potential career pathways. When students search “doctor,” for example, the calculator offers nine results (optometrists, podiatrists, etc.) and easy-to-understand visual data on annual wages, projected job outlook and education information surface for each occupation. The tool was developed by KentuckianaWorks, the workforce development board for the Louisville region, and The C2 Group, a full-service digital experience provider. This past summer, the United States Conference of Mayors awarded a $100,000 grant to KentuckianaWorks, the City of Louisville and Mayor Greg Fischer for their efforts to “raise the public’s awareness on career and education pathways, inform on education gaps, and ultimately create more career-ready graduates,” according to a prepared statement. “Having access to a user-friendly application that utilizes real-time labor market data enables students and job seekers to make more informed career and education decisions, which promotes education, family-sustaining wages and thriving neighborhoods,” said Michael Gritton, KentuckianaWorks’ executive director, in a statement. Career Calculator is currently only available to the Louisville market, but its creators hope it will inspire similar collaborations between educators, workforce development agencies and web developers. To learn more, watch the video below, or view the tool here.